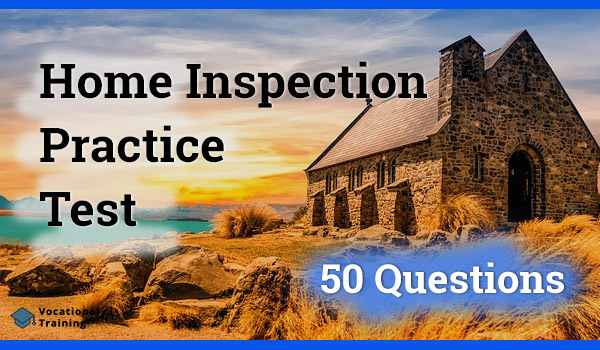 Home Inspection Practice Test: Get Ready for Your Home Inspection Exam! The Home Inspection Test is part of the Home Inspection certification program that provides knowledge in the realm of home safety and building science. The topics covered in this test include building science, business operations, analysis, and reporting. During an inspection in case of a gas leak, one shouldn't continue with the inspection. None of the aforementioned elements is required during the completion of a home inspection report. You should recommend undercutting all bedroom doors. You should recommend installation of additional return air ducts, especially in bedrooms. You should recommend installation of additional return air ducts, especially in bathrooms. The home inspection report should recommend installation of additional return air ducts, especially in bedrooms. Home inspectors are NOT required to describe the temperature when inspecting unfinished spaces. Window treatments do not require a comment in the home inspection report. There are no rain gutters. The home's foundation is compromised and there is an absence of rain gutters. The owner must install rain gutters. The absence of rain gutters in a code violation. It should be noted that there are no rain gutters. Unable to determine the total condition of the electrical system at this time. The plumbing system is not available to inspect at this time. Heating and cooling systems are dysfunctional at this time. The most adequate statement for this type of report is that the pre-closing inspection is recommended. After the completion of the report, the findings may be given in any of the aforementioned ways. Home inspection reports should contain all of these elements except the remaining life expectancy of appliances. Nothing should be done as long as the rust is not on the grounding bar. One should remove as much of the rust as possible regardless of its location. One should describe the findings in their report and recommend an electrician examine the panel. One should touch the wires to make sure they are safe to use. In this case, one should describe the findings in your report and recommend an electrician examine the panel. Please mark the most adequate description of this statement found in an inspection report: "Gutters are filled with leaves and debris. Remove debris to prevent roof damage." A correct description of a relationship between components. Incorrect description of a relationship between components. Inappropriate suggestion for a remedy to correct a problem. Appropriate suggestion for a remedy to correct a problem. This statement is an appropriate suggestion for a remedy to correct a problem. Exterior insulation and finish system. Exterior installation of finishing system. EIFS stands for exterior insulation and finishes system. One shouldn't identify the cause of the electrical problem. One shouldn't make a note of the electrical problem in your report. One shouldn't recommend the client contact a certified electrician. One shouldn't take a picture of the problem area. In this case, one shouldn't identify the cause of the electrical problem. In this case, one's report should include the make and model of the carbon monoxide meter that one has used to test for carbon monoxide. One should prepare to perform an in-depth inspection of all systems and concealed components. One should contact expert technicians to complete the in-depth inspections of systems. One should explain that they're only able to perform a standard inspection. One should ask what a "technically exhaustive" inspection is before one completes one. If one's client requests a "technically exhaustive" inspection, one should explain that they are only able to perform a standard inspection. Summary of deficiencies with repair recommendations. Summary of deficiencies with a recommendation to buy or sell. Summary of deficiencies with commentary about the condition of the home. Summary of deficiencies with a note the home did not pass inspection. In a case when one finds deficiencies during an inspection, their inspection report should include a summary of the deficiencies with repair recommendations. The roof will last for at least another five years. The electrical system is perfectly safe. None of the above observations should be included in a home inspection report. Why weather conditions should be noted on the inspection report? Because inspections in cold weather do not last as long so they cost less. Because accumulated snow or ice can prevent proper inspection of exterior components. Because inspections in hot weather take longer and cost more. Because accumulated rainwater can affect the soil around the foundation of a home. Weather conditions need to be noted on the inspection report is because accumulated snow or ice can prevent proper inspection of exterior components. One should mark the item as "not inspected" on the report and provide an explanation. One should mark the item as "failed" on the report and provide an explanation. One should mark the item as "good" on the report and assume everything is fine. One should leave the item blank on the report. If one is not able to inspect a particular component for some reason, they should mark the item as "not inspected" on the report and provide an explanation. One should recommend wall-to-wall carpeting as a remedy. One should recommend dehumidifiers in multiple rooms to eliminate water vapor. One should make note of it but make no recommendation for repairs. One should make note of it and recommend a structural engineer take a look at the home. In the report, one should make note of the case but make no recommendation for repairs. The statement "The basement is dry and is in good condition." is a conclusion. One should make note of observation and recommend to the client to hire a pest control expert. One should make note of observation and recommend client find another property. One shouldn't make note of observation since they are not a pest control expert. One shouldn't make note of observation because it was just a few termites. The findings should be reported by making note of observation and recommending to the client to hire a pest control expert. It's shouldn't be included when a component is defective. It's shouldn't be included when a component is cosmetic. It's shouldn't be included when a component is hazardous. It's shouldn't be included when a component is not present. The report should include all of the aforementioned findings except when a component is cosmetic. If one does not inspect appliances, they should inform your client in advance. If one does not inspect appliances, they should suggest the client get another inspector. If you one inspects appliances, they should include their findings in the report. Any of the above is an acceptable response. It is entirely up to the inspector to decide if they offer to inspect appliances to clients. One should conclude it may damage the exterior wall. One should conclude it may eventually decrease the home's value. One should conclude it may affect the home's interior temperature. One should conclude it may discolor the exterior wall. In this case, one should report that they conclude it may damage the exterior wall. It looks to be about 25 years old and should be replaced. It looks to be about 25 years old and needs to be repainted. It is made of aluminum and has multiple missing nails. It is made of aluminum and has been painted an ugly green. The most appropriate response is that it is It is made of aluminum and has multiple missing nails. A walk-in shower is not considered a recreational facility. Improper installation of the component. A component can be unsafe for all of the aforementioned reasons. A standard home inspection does NOT include inspection of hidden components and systems. If one notices a problem with a component or system during an inspection, both B and C are acceptable recommendations. PEX stands for cross-linked polyethylene. The inspection report must contain details on all of these problems. During one's inspection of the home's exterior, they need to inspect the carport. "I believe it is convenient for the property." "I am unable to determine the convenience of the property." "I shouldn't be making a recommendation either way." "You should find another type of home-based business." Home inspectors are not required to determine the suitability of a home, based on inspection results. You should indicate that as long as they conserve water, it should be fine. You should indicate you are happy to make repairs to improve water pressure. You should indicate the water pressure will only get worse over time. One should indicate that they do not make determinations of adequacy for any component or system. How should one respond in a case when their client, whose house one is inspecting is in a community with recently implemented ordinances pertaining to noise control, wants to know if the walls are soundproof enough to allow for social gatherings while still meeting ordinance requirements? They should remind their client the inspection does not include determining compliance with ordinances. They should recommend their client to hire a structural engineer to test the walls' soundproofing. They should suggest their client to hire a soundproofing expert to renovate the walls in order to be compliant. They should tell their client about a friend who specializes in soundproofing homes. In this case, one should remind their client the inspection does not include determining compliance with ordinances. Please mark the most adequate way for one to reflect the following information: One's client mentions he plans to flip the property after buying it and wants for the inspector to perform their inspection from the standpoint of determining value and marketability of the home. The inspector provides the best estimate possible in their report. The inspector has an appraiser review their report and gets an estimate for their report. The inspector does not include any information on property value or marketability in their report. The inspector talks to neighbors to determine local property values and includes an estimate in their report. The inspector shouldn't include any information on property value or marketability in their report. The types of warning devices that need to be included in the inspection report are carbon monoxide detectors and smoke detectors. Home inspection reports need to nclude the location of the main water shut-off valve and fuel shut-off valve. One should describe the cracks and indicate they can be repaired at minimal cost. One should describe the cracks and suggest the client stay out of the basement. One should describe the cracks and recommend the client hire a structural engineer. One should describe the cracks and inform the client of the decrease in property value. In the inspection report, one should describe the cracks and recommend the client hire a structural engineer. One should describe their findings and submit the report. One should describe their findings and recommend the furnace be replaced. One should describe their findings and suggest the furnace not be used. One should describe their findings and indicate the furnace is no longer effective. The proper way for this to be described in the inspection report is through a description of one's findings and a recommendation for the furnace be replaced. The expected service life of vinyl siding is 25 years in all climates. Cosmetic problem with the wall. A dilemma that requires an expert's opinion. The bulging plaster on one of the living room wall is a possible safety concern. Pitted gutters are just fine. Pitted gutters are a cosmetic problem. It is not your place as an inspector. It is not a good recommendation. One should not recommend copper gutters to their client after their inspection reveals the existing gutters to be pitted because it is not their place as an inspector. Should one provide a disclaimer if they include photos in their inspection report? No. The photographs speak for themselves so a disclaimer is redundant. No. The photographs are not required so any type of disclaimer is unnecessary. Yes. The photographs should not be viewed critically since one is an amateur. Yes. The photographs may not show all the deficiencies found during the inspection. If one includes photographs with their inspection report, they do need to provide a disclaimer. Roof deck can be described as sheathing. All of the above need to be inspected. All of the above is an acceptable format for a home inspection report. In order to make sure the surface of refrigerator doors work properly. In order to verify mirrors in the home are authentic. In order to test plumbing pipes for iron material. In order to post notes for the owner. Home inspectors keep magnets on hand during inspection to test plumbing pipes for iron material.